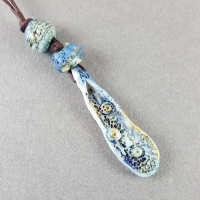 Description : Made from the finest porcelain, each piece goes through a number of processes. Once the shape has been created, it is left to dry for so long before being worked into. Textures are created using mark making techniques. 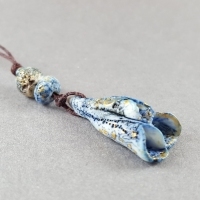 A variety of glazes are used, layering, wiping back and layering again. Some connectors have holes, while others have fully annealed wire loops. 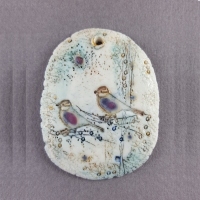 Pieces are fired twice and finished with tiny subtle dots of gold lustre. Uses : Spacers for necklaces, earrings and braclets. 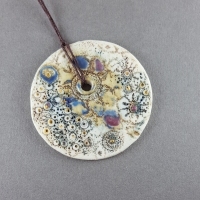 Sizes : All pendants are variours sizes which range from 3.0cm to 5.0cm in diameter.